Mars used to be covered in water and so could have been ideal for supporting life, according to Nasa scientists. Researchers found that the planet was once covered in more water than Earth is now, by working out the amount of water that has since been lost to space. 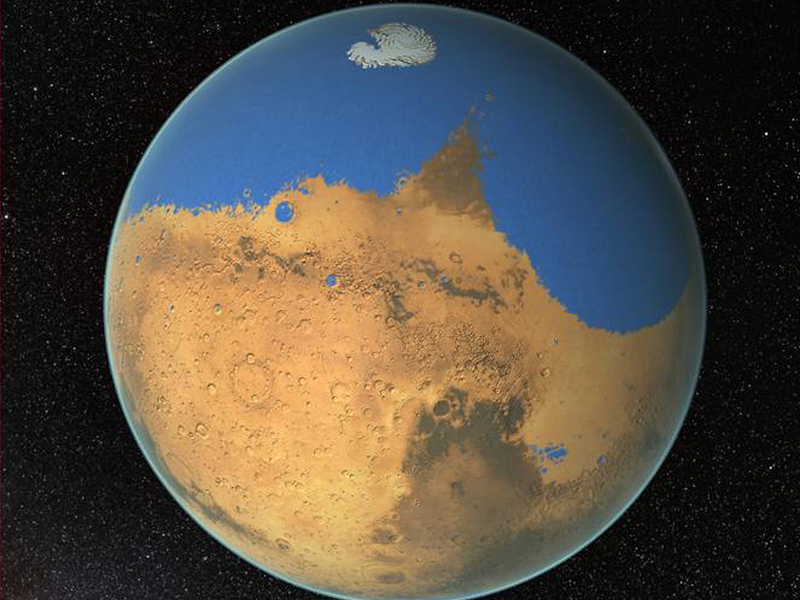 About 4.3 billion years ago, half of the northern hemisphere of Mars was covered in water, with the ocean more than a mile deep in some places. The new data changes the idea of Mars as an inhospitable desert planet that has been unable to support life, as it is now. The lack of water on the planet has long been seen as a reason that Mars is uninhabited, but the planet may have been much more welcoming when it was young. As recently as ten years ago, scientists thought that while Mars had some water it mostly came forth sporadically, and did not cover much of the planet. But scientists have discovered that much more water than expected has been lost from Mars, changing the idea of what it would have been like. “With Mars losing that much water, the planet was very likely wet for a longer period of time than was previously thought, suggesting it might have been habitable for longer,” said Michael Mumma, a senior scientist at Goddard and an author of a paper on the findings, published in Science. The researchers were able to estimate the amount of water lost using observations made by the Very Large Telescope at the European Southern Observatory. That told scientists how much water — as well as a variation on water — was on Mars, which they could then compare with the amount of water in a Mars meteorite from 4.5 billion years ago. They also mapped the amount of water over time, allowing them to work out how it changes over years and seasons. Scientists hope to learn yet more about Mars’ climate and environment through Nasa’s Mars Exploration Program. Nasa and the European Space Agency both have rovers headed to the planet in coming years, which will carry new instruments and tools to conduct research on the planet.